OMG it’s clear the list time again, and WHAT A MONTH IT HAS BEEN!!! 🛎 #clearthelist is a monthly language learning round-up sharing monthly language learning goals, support, and accountability. 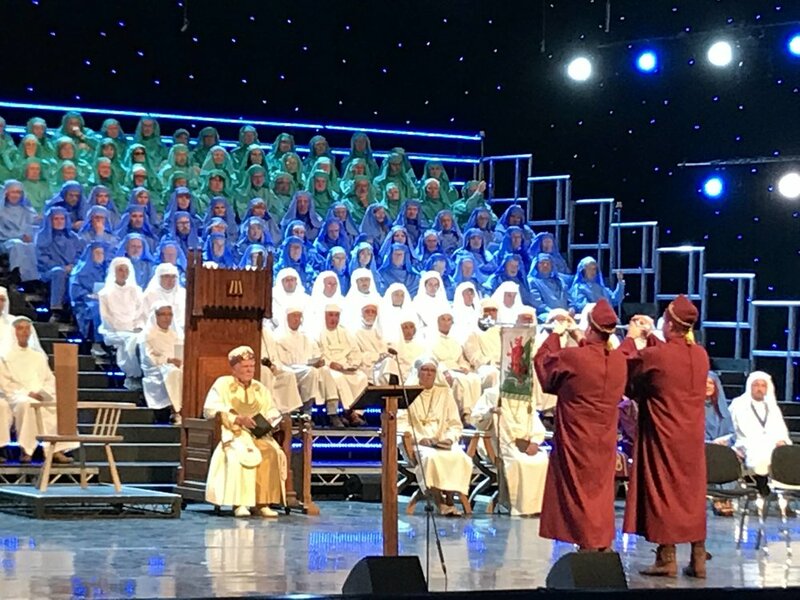 Barely home from the Retreat, I was back on the road, this time for my own immersion experience at the Eisteddfod Genedlaethol in Cardiff. If you’ve never experienced an Eisteddfod before, they’re hard to describe. Imagine EVERYTHING WELSH CULTURE in one place, colourful and happy and ancient and new, packed into a week-long festival. In other words, it’s amazing! All that August travel didn’t stop us from celebrating a major Fluent Show milestone as we recorded our 100th Podcast Episode this month. We celebrated with a quiz and a live show including FIVE awesome guests: Shannon Kennedy, Gabriel Wyner, Richard Simcott, Kylie Sturgess, and Benny Lewis. So much fun! Catch up with us here. Time to review August’s goals and get set up for what’s in store in September 2018. As expected, August was not a month for my dabble languages Spanish and Chinese. Instead, I taught lots of German and learnt lots of Welsh, so let’s focus on Welsh. I had grouped these skills together for August because of the trip, and would say I delivered on both! My room in Cardiff was rented from Cymdeithas yr Iaith Cymraeg, meaning I had plenty of Welsh-speaking flatmates. I even ran into Robin, who I’d chatted to before on HelloTalk! In addition to that and the volunteering, I met up with friends and Welsh speakers I met online and spent over half of my days speaking the language. At first, speaking Welsh was tricky and my head was working extra hard on day 2. You know that “I’m an idiot who understands nothing” feeling? Yep, I had it too! But by day 3, it felt like a lightbulb was coming on and Welsh became much easier. Here is a video filmed by Nicky Roberts, showing the way I was able to speak on my final day in Cardiff. I’ll be honest, I’m actually pretty proud! This is approaching free conversation in Welsh, what better feeling could I have. And shout out to all the Welsh people I spoke to - turns out almaenes sy’n siarad Cymraeg (a German woman who speaks Welsh) has some novelty value and everyone was extra lovely. One little note here on immersion, and you’ll see this as I write about the German Retreat on the blog too. This visit to Wales definitely felt like the most effective, productive, and encouraging immersion experience I’ve had so far. Last time I visited the Eisteddfod, my level was “high beginner” (late A1 ish) and I found it motivating and enjoyable, but I wasn’t ready to speak Welsh freely yet. This time, with my level at a firm “intermediate” (B1 ish), it was WAY different and I enjoyed the experience because I was able to get truly involved. Often, we think of “immersion” as a learning strategy that is beneficial to complete beginners. But in fact, it’s more helpful when you’re at the intermediate level and you DO have some knowledge to build on. This is when your mind is ready to join up the puzzle pieces and take you to the next level. I got about 7 chapters further into Sgwp!, but still not finished. My goal was to get halfway into it, and I would say I’m at 45%. However, I also read through the whole issue of Lingo Newydd, including the red bits for advanced learners! Plus lots of incidental reading of programmes and tickets during the Eisteddfod. As expected, I didn’t put any longer pieces of writing together in Welsh. I regularly direct message with friends and I posted on Instagram a few times with captions in Welsh, but I’m beginning to feel that it’s time to take my writing one step further. Every month, I log my “daily contact” with the Welsh language. And August was great, with 23 days out of 31 logged. As always, this also depends on me remembering to tick a box, so it’s not a 100% accurate number. Best strategies: Visit where your target language is spoken, text friends in the language, and put the magazine where you’ll actually read it. I’m now at a level where I can test out of every new level Duolingo gives me and I never remember any of the new vocab it shows me. Duolingo, at my current level, feels like it has become inefficient for Welsh learning. Have you experienced anything similar? I have noticed that my podcast Pigion has become boring, but I’ve started listening to Radio Cymru live through the TuneIn app. There’s more music and I understand more than on the podcast, even though the podcast is supposed to be for learners! Radio also makes me feel more connected to the community of Welsh speakers. The goal here is to switch the radio on in Welsh 2-3 times per week. I’m feeling keen to try something different after a year of subscribing to Lingo Newydd, so for this month I’ll stick with Sgwp! and keep an eye out for a new printed publication I can try out. As usual, the goal is to progress with Sgwp! It’s not a bad novel, and the short chapters are helping lots. In August, I picked up Say Something in Welsh (SSiW) again and got over my hesitations between the Northern and Southern dialect versions. I now just make my sentences in either dialect and go with the flow, so I feel ready to progress. I’m on challenge 16 of level 2 and my goal this month is to move through challenge 18. And lucky me…I’m going to Wales again! No details planned yet, but I’ll be sure to head North and speak more of the language. Time to get real: I should put down a page of writing and get it corrected. For writing practice, it can be hard to know where to look as a solo learner. I’ll try the Welsh exam council and see what they ask for at the intermediate level, and work on writing an exam paper and getting it corrected. If I don’t get this done this month, no harm done as I know September’s a busy one and I will make sure I still DM friends in Welsh every week. Are you a language waffle or a language pancake when you travel? Do you feel the same as me about Duolingo once you’re above the B levels? Are you setting goals?